Makes me want to grab a paint brush and break open a tin of Black Japan. 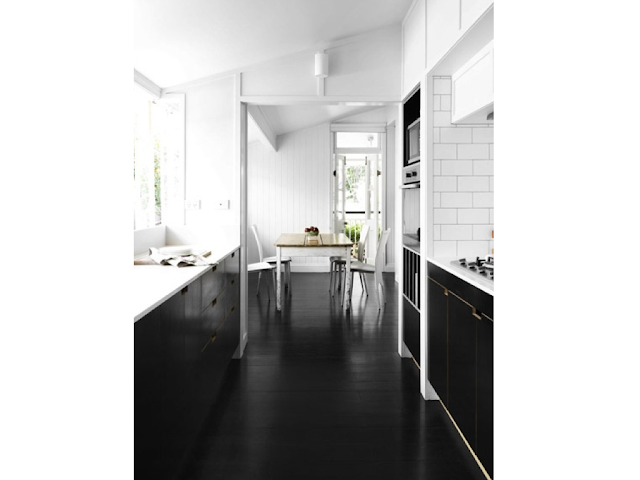 And when I look at these images, I start to think about using black cabinetry in the kitchen again. Oh decisions!!! But from a functional perspective, how easy are they to keep clean? What about the dust, and crumbs on the floor? (My kids happen to be very messy eaters.) Would it do my head in? Hardwax oil is based on natural oils and waxes that penetrate into the wood surface making the floor extremely tough and hardwearing. Flooring that is damaged or showing signs of wear in patches is easily repaired by simply cleaning the surface and applying a maintenance coat to the area. There is no need to sand and re-finish the entire surface. Conventional lacquers require sanding the entire floor back to bare timber to re-coat, which reduces the thickness of the timber - can be a problem when you start to run out of timber above the tongue and groove. 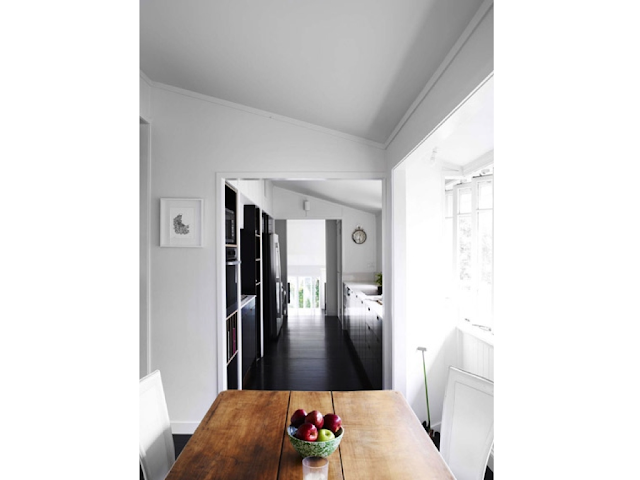 Do you have a black painted timber floor? Care to share the pros and cons? Love them or hate them? I'll leave you with a final image of the bathroom from the same house above. I love the detail, including the brass edging around the mirror. 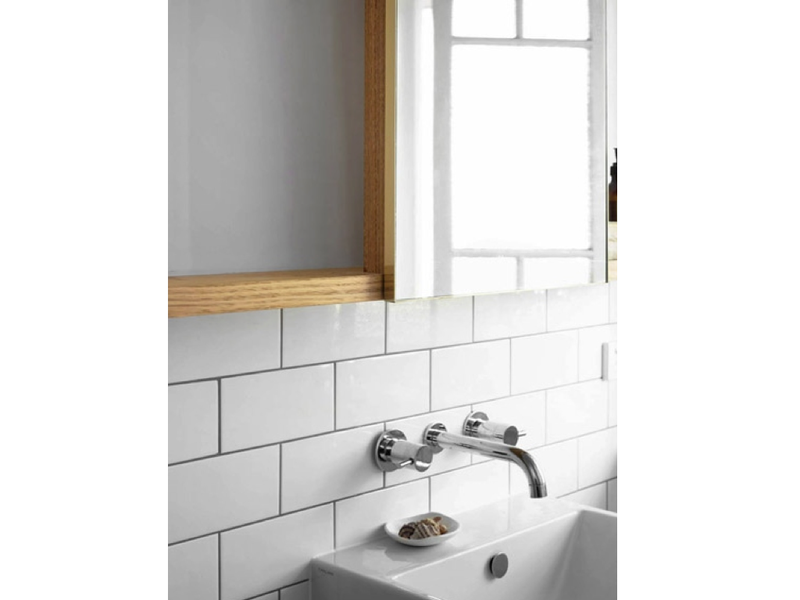 We have the same tiles and tapware specified for our bathroom and ensuite. The black floor does look stunning with the crisp white but I can imagine the dust and crumbs causing a daily headache with cleaning. Love the look of the black floors but you would probably need to sweep everyday. Restoring the Old Girl has her floors black japped and they look lovely. We used tung oil based estapol on our back floors so we could just clean and recoat them when they wear. I like the look of the dark floors. We're considering a dark finish to tie in our new and old pine flooring. I worry about how practical they will be with a toddler and a baby though. You could have both you know - a section say as a feature and the rest timber ... I am considering painting the floor boards in the kitchen white ... This too looks amazing ... When we rip the tiles up ... But the rest I will leave pine... Just for something diff !!! The only prob tho with the paint is that once you paint if you want to change it - headache to remove paint !!! When we pulled out our carpets, lino and layers of newspapers we found that the hall, living room and bedroom had been done in Japan Black and the other rooms were just raw wood. I love Japan Black so we left those room and then stained the other rooms the darkest brown we could find...we had neither the time nor the money to do Japan Black when we moved in. I love the way it looks. Our "formal" rooms are black and our other rooms are a sort of industrial version of the same. As for crumbs and think I think the dark floors are better than lighter coloured floors...you can sometimes see a light sheen of dust but our dog is black so at least her hair blends in! Maybe have a think about how much natural light you'll have? 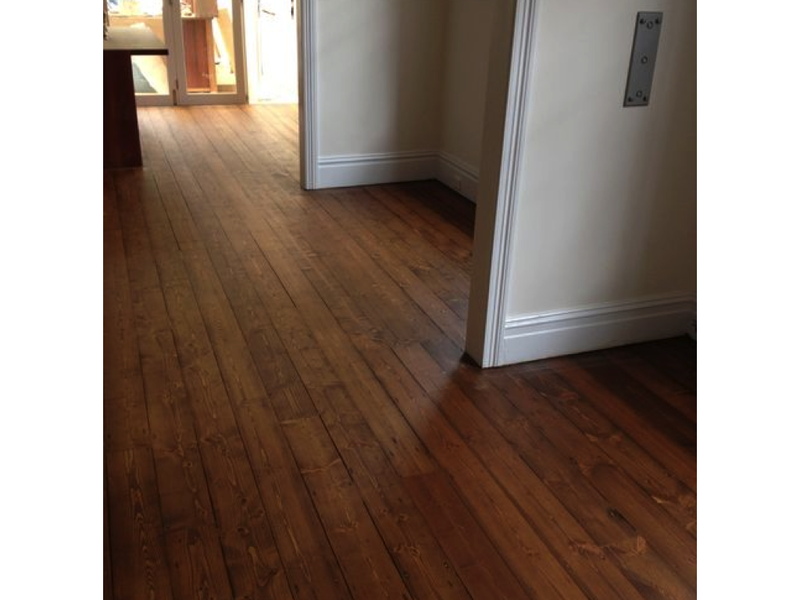 Our floors were really dark when we arrived and are now natural coloured hoop pine in the finish you're looking at. Really practical but mainly bc our house was too dark to carry off a dark floor. Your pictures all look to be flooded with natural light and they do look stunning! I really like the look of a black floor, but I know that the dust would drive me insane. I really love the look of that floor you are looking at - gorgeous! I have polyurethane shiny floors and they do need redoing after a few years of hard wear. So that looks like a great finish to go for. I second checking "Restoring the old Girl" as I think she did a post on how her floors were coping with real life living. Good luck! LOVE black floors! I've just put down black floor tiles in my bathroom and will be doing black lino throughout the rest of the house as soon as I have some of that magical thing called "money"!! The black floor looks lovely very striking!! I painted my daughters bedroom floor white and although it looked lovely it was a complete pain to keep clean and showed every mark!!! Hello, I have a black japan floor...(floating floor as am in apartment) I have a 1 year old so I mop at least 3 times a day and then have to dry off with cloth so no trace of water is left on floor and it still looks dirty... I would never recommend a black floor - My husband loves the floor though.... Before the baby i still moped every day. We are saving for a renovation (haven't decided by who yet) in the next year and I am interested how living with your wax floor goes.